This video poem is a celebration of Summer lived well as a child who spent most of her time outdoors, sampling and savoring what nature had to offer. The poem has a headlong energy that comes from short lines full of imagery, occasional enjambment, and a of stream-of-consciousness catalog of summer activities. The animated images reinforce the verbal imagery, creating graphical associations and occasional morphs to reinforce the sense that activities are blending seamlessly from one to the next. 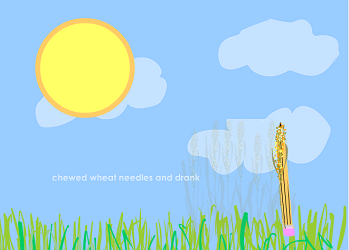 In the still image above, for example, we are transitioning from an image of a pencil (used to write novels up on a tree) to “chewing wheat straws” in a field— and you can see the wheat fading in while the pencil morphs/fades out. The visual and narrative parallel from beginning to end create a sense of circularity for the experiences described. And why not? Days like that are worth reliving.